Behavioral changes, such as irritability, depression, etc. Depending on the accident, whiplash can be difficult to diagnose and sometimes the impact could be unknown, such as forgetting that you fell down awkwardly during a sports game. It’s important to see a chiropractor if you’re feeling any kind of neck pain or stiffness in your upper body. 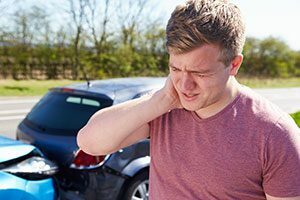 Glacier Chiropractic has the knowledge and experience to help ease the aches and pains caused by whiplash. It is very common for most people to ignore the minor symptoms of whiplash because it could easily be shrugged off as pain associated with aging or everyday stressors. With the help of a chiropractor, these symptoms can be addressed and alleviated, regardless of whether or not you have clinical whiplash. Ice your neck for 15 min. every 3-5 hrs. Everyone’s body heals differently, depending on your age and other pre-existing conditions you had prior to the accident. It could take anywhere from a week to several months to fully heal. The sooner treatment is applied the faster you will recover. Ignoring the symptoms of whiplash can cause chronic neck pain, which would result in a permanent injury. Glacier Chiropractic is here to help with chiropractic whiplash treatment. We’re located in the easily accessible Ballard area of Seattle. We’re always accepting new patients, and walk-in visits are welcomed. Call us today to find out more about our specials and package deals.